This Rocker from Rochester is definitely deserving of this month's ION Indie Magazine REVERBERATION "Artist of the Month"--with edgy vocals, ripping guitar licks, excellent songwriting skills and stage prescense that catches and holds your eye. Melia is perfectly placed to fill a still rather wide gap in the Rock market. That of the female fronted rock band. While her wild purple hair is an attention grabber, it’s her powerful voice that will catch you first and pull you in for more. With a new EP “Skeletal Remains” out now it is clear that there is no stopping the momentum Melia has going for herself. You might not know it yet but we are simply all just along for the ride! Free MP3 download: Melia, "Soundproof Walls"
SoundSpike's free MP3 download for Wednesday (2/27) is "Soundproof Walls" by singer/rock guitarist Melia. The featured cut is the title song from her debut LP, "Soundproof Walls" available now on iTunes. In just five short years, 21 year old Melia has become known as one of the top female indie rock artists on the music scene today. This musical prodigy is considered one of the top female lead guitarists of this generation, being compared to the likes of Joan Jett, Bonnie Raitt and other female guitar legends. The recent winner of 3 awards, including "Best Female Rock Artist", as well as "Best Rock Song" and "Song of the Year" ("Just a Bride") at the 2012 Indie Music Channel Awards held at House of Blues in Hollywood, Melia's new EP, "Soundproof Walls" is receiving rave reviews, as she begins her first tour. 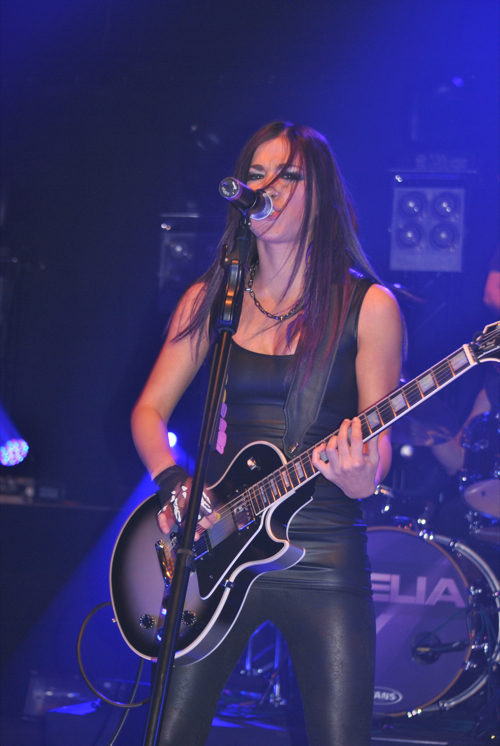 Melia began her music career as a guitarist at the age of 16. She had been trying to get her parents to let her take guitar lessons after going to her first Green Day show during it’s “American Idiot “ tour two years earlier. They made her wait two years before taking up lessons, which she feels propelled her motivation. She excelled at guitar very quickly, practicing 6-8 hours a day and within eight months of taking up the instrument had formed her first band with a couple of high school friends. Although she had always written poems and lyrics, while with her first band she also began writing her own music and lyrics and started playing some of that original music at shows. Never thinking of herself as a vocalist she took on that role in her first band as well and wanting to sing to her fullest potential she began taking vocal lessons. After graduation she became serious about pursuing her musical career. During that summer after graduation she had the experience of a lifetime when she attended another Green Day concert and was chosen by lead singer, Billie Joe Armstrong, to play guitar for the song “Jesus of Suburbia”. Billie Joe noted after she played that she was one of the best guitarist they had ever pulled on stage. She is still splitting her lengthy practices each day between guitar and vocals, in addition to becoming a guitar teacher at the school where she began her lessons. She is now playing with some excellent musicians, James (Doc) McGowan on drums, Tim Latus on bass and most recently Jimmy Whitaker on rhythm guitar. The music is a guitar-driven alternative rock style with message laden lyrics that come from her personal experiences or of those close to her. Melia is currently getting ready to enter the studio again to record a full length CD. She has written over 50 songs and is in the process of narrowing down which tracks may be included on the newest release. Melia has been opening for national acts including The Offspring, Eve 6, Gaslight Anthem, Our Lady Peace, The Tea Party and Steve Vai. Melia Maccarone, a 21-year-old rocker from Rochester, N.Y., sang originals and covers with her band at the Deane Center’s Hurricane Sandy Relief Concert in Wellsboro on Friday, Jan. 11. Opening for her were Brandon Lusk, of Wellsboro; the Versa/Vice, of Liberty and the Brothers Callahan, of Wellsboro and Tioga. For related story, see page 1 in the Living section. The Indie Music Channel brought its Indie Music Revolution Festival to Water Street Music Hall this past weekend. The event boasted a cornucopia of young talent, including plenty of stuff from the home team. I caught Methanol Friday as the band blasted its big rock with hooks. This group has really settled into a solid groove and has transcended its influences; it owns its own brand of rock ’n roll. Methanol ended its set with guitarist White Mike smashing his guitar a la Townshend, to my secret delight. Between getting clobbered for two nights at Water Street, I spent a beautiful day at the Corn Hill Arts Festival’s Gazebo Stage, where I got to hear some Big Easy, not-too-greasy New Orleans/Dixieland stroll from The Roc City Stompers, some analog dub-step with Roots Collider, and the classic bluesy swing with the always stylin’ and profilin’ Electro Kings. I made my way over to the main stage where The Campbell Brothers were laying it down hard. They were smack in the middle of a foot-stompin’ gospel throw-down. The Campbells never fail to bring tears to this heathen’s eyes. Hallelujah! The "Hang on to the Dream" competition gives anyone age 17 and younger a chance to impress judges and potentially win free studio recording time. Many Rochester area singers took a shot, but the prize was eventually won by a 14-year-old girl from Spencerport. She will have the opportunity to sing at the Water Street Music Hall tonight, and then will get 20 free hours of recording time at GFI studios in Rochester. Three-time Indie Music Award winner, Melia, who is also from Spencerport, was at the event, and thinks competitions like this are great for Rochester. "I think it is awesome that there are competitions out here. Especially cause there is so much talent in Rochester that goes unseen," says Melia. "So I really, really feel that it is awesome. When I was younger, I would've loved to do all that. So I think it is awesome that we are doing this for the young kids round here." While there hardly seems to be any space left on the summer calendar for another festival, Water Street Music Hall is squeezing one in on just a few week’s notice: The 2012 Indie Music Revolution Tour, built around a Los Angeles-based indie music web site and a Rochester rocker, Melia, who won three awards at The Indie Music Channel’s awards show at LA’s House of Blues. During the course of the phone conversation between Ewing and Chmiel, that show became a three-day, dirt-cheap festival Friday and Saturday at Water Street’s two stages, and Sunday at Boulder Coffee Company. Sunday’s event is what Ewing calls “The Indie Music Mob,” which he compares to the social-media propelled flash mob phenomena or its progeny, the cash mob. The Music Revolution Tour is trying to book shows in the hometowns of all of the winners from its awards event, in venues as far flung as London and Australia. This weekend’s lineup was flying together in a very indie way; Ewing estimated that as of Thursday afternoon, some 30 indie acts from around the country had arrived in Rochester to play, with five to 10 local acts registered. Another aspect of the event is the Hang On to the Dream Music Competition starting at 10 a.m. Saturday at Marketplace Mall. Children ages 17 and under will get to perform on stage for a chance to record a CD and perform live that night at Water Street. Water Street rushed the festival onto the schedule because this weekend was its only open weekend through September. Next year’s event, if it happens, will take on more of a festival feel, Chmiel said, including a music-conference aspect for the attending acts. Rochester, N.Y. — Melia Maccarone, 20 makes music that makes waves. The local singer-songwriter began playing guitar when she was 16. In the four years since, she’s used Twitter, Facebook, Myspace, YouTube, and more to build a fanbase that has taken her to the No. 1 spot on the musician social network ReverbNation’s list of local alternative rock artists. It's pretty much alternative rock. I'm influenced by a lot of older stuff actually. I'm influenced by Nirvana, Soundgarden, obviously Zeppelin and Hendrix. I'm influenced by a lot of different eras, but it's pretty much alternative rock'. Is the Internet a big part of your success so far? Yeah, I think it's a huge part of basically everything in the music industry right now. I wouldn't have gone to LA I think without the Internet. I'm on Twitter, I'm on Facebook, I have my own website, I just do as much as I can online because that’s where the majority of people are these days. I signed up on the Indie Music Channel website and kind of got discovered on there and that's how I got signed up for the awards and how I got nominated. Without that I wouldn't actually be out there. I haven't been all over the place. A lot of it is just people hearing me online. When I was younger I was really interested once I started listening to Green Day. That made me want to play guitar. My parents wouldn't let me for a couple years because they wanted to make sure that I really wanted to. I eventually kept bugging them and, two years later, when I was 16, I started playing. I worked hard at it. I would practice eight hours a day during summers and I would just put everything I had into it. Why guitar? What attracted you to that particular instrument? It just seemed more rebellious to me. I didn't really fit in that well in high school and I got made fun of a lot, so I was kind of on my own. I looked up to bands like Green Day and My Chemical Romance and Nirvana and it just seemed like that was this rebellious aura about it. I was really drawn to it. Is rebellion still a part of it for you? It is, yeah. I like to be different. A lot of times I was made fun of in school for being different and eventually once I started playing guitar it made me kind of embrace it rather than being ashamed. I think it just gave me a lot of confidence in who I was. It allowed me to be myself and take pride in all my differences. Was there a moment that you knew this was your passion? How has growing up here informed your work? In high school and middle school mostly, I think everybody goes through that awkward phase where people start forming cliques and it changes things. You start getting bullied. That’s another subject that I'm really passionate about is bullying, because I went through a really hard time and I know a lot of people that have as well, especially in Spencerport. It was a big problem in high school, and I think the Internet made it worse because you'd get bullied at school and then you'd come home and get bullied on the Internet. I think that had a lot to do with the start of it, because I needed some sort of an outlet that was positive, and I think music really spoke to me and made me connect with it, and that's what influenced my passion about music and my experiences. Why do you think you practiced so hard in the beginning? I think it was since I started late... By the time I started I thought I had all this time to make up for. The perfectionist in me wanted to be the best that I could be and I just kept going and going and going, and I'm still going. I don't feel like I'm at the level I want to be. I keep pushing and pushing, and I think that’s part of my personality, but I think a lot of it I owe to my parents, because it just gave me that much more motivation to keep practicing. Did winning these awards motivate you more? Oh absolutely yeah. I write from my heart. It's my passion. It's my release. A lot of times when I'm noticed for it I'm like "Wait really?" I'm still trying to better myself, so it's cool. It's awesome. Is this your job now? I work at Collichio School of Music in Spencerport. There I teach guitar and vocals, but that’s where I started lessons. It's pretty much my job. Outside that I try to do as much as I can on my own and push as hard as I can. It's my passion. It's what I want to do. It's how I express myself. It's where I fit in. Definitely it's my job. As a teacher, how does it feel to be igniting that passion in other people? It’s really cool. That's my favorite part about that job is that I get to see all this talent and really help them progress and be confident. With my teacher, George Collichio, he really believed in me and gave me confidence. A lot of people start late and they think since they started late they're never going to be good, that they're never going to get there, and I love being able to show them how much talent they have and push them and help them step outside of their boundaries and their comfort levels. There’s a ton of talent in Rochester that people don't even know about yet. They're just starting out. See Melia live at Water Street Music Hall on July 7, at Sticky Lips in Henrietta on July 20, or at The Jukebox in Spencerport on July 27. Local musician Melia Maccarone is joining the fight against bullying with a benefit concert this Friday at the Montage Music Hall in Rochester. All the proceeds from the show will go to the Pacer Center, a national organization that helps school districts with anti-bullying programs. "I just wanted to make sure that I did something," she said during a rehearsal break Monday night. The 2009 Spencerport High School graduate said she was a victim of bullying during middle school and high school. Writing music and taking up the guitar at 16 made her feel things would get better and took her away from feelings of low self-esteem. Now Maccarone wants to share her inspriation with other kids who may be battling bullies. "If you're different, I think that's a good thing," she said. "I think it's good to be your own person and be original, and I think that's what happened to me, I just started realizing, through music, that it's a good thing to be different, it's a good thing to be your own person." Friday's concert will feature five different bands, including Maccarone, who is playing with bassist Tim Latus and drummer James McGowan. Also performing Friday will be Red Inc., Mouth Full, Love Tunnels and This Life. The concert begins at 7 p.m. and goes until midnight. Tickets are $7 in advance, $10 at the door. To learn more about how to get tickets, go to Facebook.com/meliarocks. Maccarone is hoping to organize another concert that will be open to kids 12 and up. She's also preformed and spoken to students in Spencerport and Brockport. Her CD, Soundproofs Walls, was released last August. Melia Maccarone of Rochester, a 2009 graduate of Spencerport High School, was a big winner at the 2012 Indie Music Channel Awards in Hollywood, California. She won awards for Best Female Rock Artist, Best Rock Song for “Just a Bride” and Song of the Year for “Just A Bride.” She was also a finalist for Artist of the Year and Album of the Year for her EP “Soundproof Walls.” A panel of music industry professionals chose the winners. The awards show was held at the famed House of Blues on Sunset Boulevard on April 29. Emmy award winner and creator of the Indie Music Channel, Christopher Ewing, presented Melia with her awards. Melia is in the process of writing new music for an upcoming CD. She has a few local shows lined up this summer including a gig with the Deborah Mangone Band at Sticky Lips in Henrietta on July 20 and the Molson Canal Concert Series in Buffalo on August 24. Melia’s music is available on iTunes and CD Baby. and shows just how talented this young songstress is. great and I'd recommend everyone take a listen. Out. Each of these tracks offers an identity of their own, but are equally incredible. recommend this artist and project to anyone looking for great melodies, music and vocals. A musician for just four years, Melia Kimberly Maccarone has already made serious inroads into a promising career. “Soundproof Walls” is her debut long-player, recorded with her band (Dominic Ciaccia - drums, Tim Latus - bass, Rob Cerame - guitar), with Melia responsible for lead guitar, vocals and the songs. That’s quite a load for a 20-year old, but she seems completely unfazed, and her all-round performance is incredibly confident, leading her band through a collection of brash pop-punk and upbeat ska-rock. The production on “Soundproof” is gloriously vibrant; the music almost leaps from the speakers. It’s absolutely appropriate, as there’s nothing lo-fi or half-hearted here. Melia’s songs are focused and vivacious, falling somewhere between the naïveté and pop thrill of early Blondie and No Doubt’s Jamaican infused bombast. Surely it can be no coincidence that “I Wanna Be Your Girl” brings out Melia’s inner Gwen Stefani. It remains a highlight of the seven-track set, though there’s no shortage of competition. “Checking Out” possesses a great vocal hook and serious guitars; “Sleaze Parade” is complex and technical, and thoroughly enjoyable. “Stay” indicates a talent for balladry, which might come in handy, should the mainstream come calling. Alternative American rock with a big future lying in wait. While some artists set out purposefully to sell lots of records, for others, popularity is an added bonus. The latter seek self-respect not fans; they follow hearts not trends. One suspects that Rochester native Melia Maccarone is such an artist, happy to rock out in her own favoured genre, despite the snobbery that can often surround it. Melia (vocals, guitar) and her band – Tim Latus (bass) and Dominic Ciaccia (drums) – play alternative rock music; or pop-rock, if you’re willing to blank out the negative connotations of such a term. It’s true that fans of Kelly Clarkson and Ana Johnsson’s rockier moments will find much to like about Melia, the big chorus setups making such comparisons unavoidable. It would be highly inaccurate to suggest there wasn’t a great deal more to Melia however, and her determination to forge out a career in music is as good a place as any to start explaining why. Having wanted to learn guitar at fourteen, it wasn’t until two years later that she was allowed to start learning her craft, by which time most would have lost their passion and moved onto something else. Not Melia however, and merely a further three years on, she is already a mightily impressive guitarist. Daily eight hour practices have surely helped, but there is also a natural intelligence to each aspect of her music; her guitar playing no exception. The flourishes are superb but modest in duration, slotting nicely into the structure of a song rather than casting a boastful shadow over the rest of proceedings. They’re allowed to do so by some impressive songwriting. It may not be revolutionary, but it really doesn’t need to be. Melia seemingly understands the intricacies of song construction, not just what works but also why, she doesn’t just produce big stand-out choruses, she capably builds around them. When showing off her softer side, her sound becomes very much like the now split British rock group, Che, which those who have heard ‘Try This’ will recognise as a very good thing indeed. No matter how impressive and well implemented the guitar playing, nor how competent the songwriting, the vocals could make or break Melia as a front-woman. Fortunately, she succeeds in this respect too, sounding a little like the aforementioned Johnsson and Clarkson but possessing an intense rawness that is lacking in both, the occasional snarl creeping into her authoritative, personal delivery. Melia is a lead-guitarist and vocalist, but most importantly of all, she is a genuine artist, able to combine her individual talents by writing great songs. I don’t doubt that some will dismiss her on the basis that her take on rock is catchy and accessible, but hopefully she will stick to her guns and just produce the music that feels right to her. Those prepared to give Melia a chance could very well be hearing a rock-star in the making. Watch out for Melia’s debut EP, tentatively scheduled for a June/July release. Melia is a young punk-rock goddess from Rochester, NY. She started playing guitar 3 years ago and now fronts her own band and shreds on her Silverburst Custom Les Paul from dusk ’till dawn. Her music is polished punk in the same vein as modern Green Day and her recordings are well-produced performances. Melia is not content trudging through the trenches as an underground gem and, in her case, I think that’s a good thing. She’s got the whole package in terms of her skills, writing, and looks; I’m sure she’ll hit hard when she’s noticed by industry suits, but I hope she stays true to the underground because that’s where longevity and artistry lives. Check out Melia’s Facebook page by clicking here and learn more about her, see pictures of her band in action, and keep up-to-date on her upcoming gigs. Melia Maccarone was a bit of an outcast in high school. While most of the other girls were into gossip, boys and pop music, Maccarone wanted to rock like the guys in her favorite bands — Nirvana, Soundgarden and Green Day. "I never really related to anybody my own age, and I definitely didn't feel like I fit in a lot (in high school)," says Maccarone, now 19, during a recent phone interview. She was 14 when she decided she wanted to play guitar. Her inspiration: seeing Green Day in concert — especially after the band pulled an audience member onstage to play guitar during a song. So she went to work on her parents, trying to persuade them to let her take lessons. Two years later they agreed, and before long she was practicing 10 hours a day. She vowed to her mother, who had been with her at the Green Day show, "The next time they come to town, I'm gonna be the one pulled onstage." Several years later — in 2009, Maccarone went to see Green Day play in Albany. Only this time she brought a sign reading "Pick a girl to play guitar" — which she held up from her fourth-row seat — and they did. The coolest part about getting to sit in on "Jesus of Suburbia," says the Spencerport resident, was being told by Billie Joe Armstrong that she "was one of the best guitar players they'd had onstage, and that's when I freaked out for a minute. "He's, like, my idol, the reason I started playing, so it was cool ... definitely the best experience of my life." Maccarone (who plays The Montage Music Hall on Friday, Feb. 4) continues to gain confidence as a musician and songwriter. Another performance that helped her come into her own happened last October at Hollywood's legendary Viper Room. "I have never been more stoked for a show," she says. But because Maccarone isn't old enough to drink, she was kicked out of the club between sound check and show time. "It was freezing outside, but I had to just wait there until I went onstage. And I did jumping jacks before I went on because I was so nervous, anxious and excited." Maccarone says she "flips a switch" when she walks onstage now and becomes "a different person." And she has learned that the songwriting process can be very therapeutic when it centers on real-life experiences and emotions. That's not to say that stepping into the spotlight as a female lead guitarist is always easy for her. "A lot of people don't believe I can play until they see me, and I think that's completely different from when a man says he can play — everyone just believes him," she says. "A lot of times I really have to prove myself to people, and I think that's just because there's not a lot of female lead guitarists, which is another reason I wanted to do lead. It bugged me that a lot of girls were always playing bass." Maccarone will have the chance to prove herself again on an upcoming seven-song EP (as yet untitled), which should be out in the spring. The recording will include the three songs from Melia, her debut EP released last year, and four new singles, which she's working on with drummer Dominic Ciaccia, 26, and bassist Tim Latus, 23, at Red Booth Recording in Pittsford. The songs' distorted guitars and angst-filled lyrics reflect the influence of Maccarone's favorite '90s grunge bands. Grinding guitar solos are never far behind, and the sound is aggressive. "Everything is very in-your-face," as Maccarone puts it. Fans should get to hear some of the new tunes at the Montage show, along with classic grunge and neo-punk covers. Maccarone's excited about the show, having spent so much time in the studio recently. But no matter where she's playing, she's having a blast. "Nothing's better than following your dreams," she says. Melia Maccarone always liked to sing, but for a long time, "I was afraid to do it in front of people," says the 18-year-old Gates resident. And even though she started playing guitar in the 11th grade, she didn't play in public. But after graduating from Spencerport High School in 2009, she became serious about pursuing music. "My determination finally broke the fear, and I advanced quickly because I wanted to make up for lost time," says Maccarone, who has since performed her alternative rock set at several local bars. What are you listening to now? Joan Jett's "(I'm Gonna) Run Away" from the album I Love Rock N' Roll. I've always liked her, but when I saw The Runaways, it totally got me in the mood to listen to her stuff. What's the best show on TV? Celebrity Rehab with Dr. Drew. It's very raw and real. It shows people what drugs can do to you. It's not like one of those dumb love reality shows that have no meaning. What's the last movie you saw? The Runaways. I saw it three times (and) it was great, I think because I can relate to being that "female rock chick." Melia Maccarone, a local guitar player/singer-songwriter from Rochester has been playing shows almost every week either in Rochester or the surrounding area. Recently she played a show at The Shop Cafe here in Ithaca and in the near future she may have shows at Castaways as well as other Ithaca venues. C: How long have you been playing? M: I’ve been playing guitar two years and singing for a year. C: Is it difficult being an independent artist? If so, why? M: It is very difficult to be an independent artist. It’s hard to get people to believe in your music, especially at home. C: Are the songs that you write a message to your audience or a vocalization of how you are feeling at the time, etc? M: My songs always have some sort of message behind them. I’m not afraid to admit to the world that I’m depressed, sad, or confused because I think a lot of people are. I’m not gonna write a happy song if I’m not happy. I also wouldn’t write a sad song if I wasn’t sad. It just doesn’t make sense. I think writing about what I’m going through gives people hope because its real. It shows them that they’re not alone in this world. That’s the real purpose behind me ever starting music. Not just to find a positive outlet for myself but to give people around the world an outlet. There’s a lot of music today that lacks truth as far as emotions go. There are a lot of artists who have someone writing for them. How could my fans look up to me for my music if I am not the one writing it or if someone told me what to write about? I’m not perfect and I’m not afraid to admit it. I’m human. C: You clearly are an original and individual artist, but being a female guitarist, do you ever have trouble with audiences or people of the business trying to force you into a cliche or a stereotype? M: I always have trouble with people trying to force me into a stereotype. Number one I’m always compared to girls that know all of about two chords on guitar until people actually see me play lead. It really irritates me that I have to prove myself so much because I’m a female. All I have to say is if a guy can do it there’s no reason I can’t. I find a lot of producers try and push me into the Avril Lavigne style. I am anything but that. I have no desire to be a cutesy girl with a prop guitar and I will make sure that is clear before anyone tries to change me. I decide who I am. Just like I won’t get implants or get plastic surgery for guys to like me, I will not change my style to make people like me. It’s the same concept in my mind because then how will my fans be true? How would love be true if you changed yourself entirely for that person? erence in mood or song choice between your acoustic shows and electric shows ? M: My electric shows are of-course more aggressive but that’s the nature of it. When I have my electric guitar and have drums behind me I feel so much energy just rush through me. Acoustically I’m more vulnerable. I’m more emotional. I think about every word I’m singing. I slow things down. I change things. I have less rules acoustically. C: What gigs do you have coming up? M: I have a gig at A-Pub the 16th of April and at Damian’s the 30th of April. C: If you could jam with anyone dead or alive, who would it be? M: If I could jam with anyone I’d have to say Hendrix or Kurt Cobain. Hendrix is just so amazing and Kurt I feel like I relate to a lot. C: If you could be any cheese in the world, what would it be? M: If I could be a cheese .. it’d be Swiss. It looks like someone shot it a dozen times but its still alive and going.